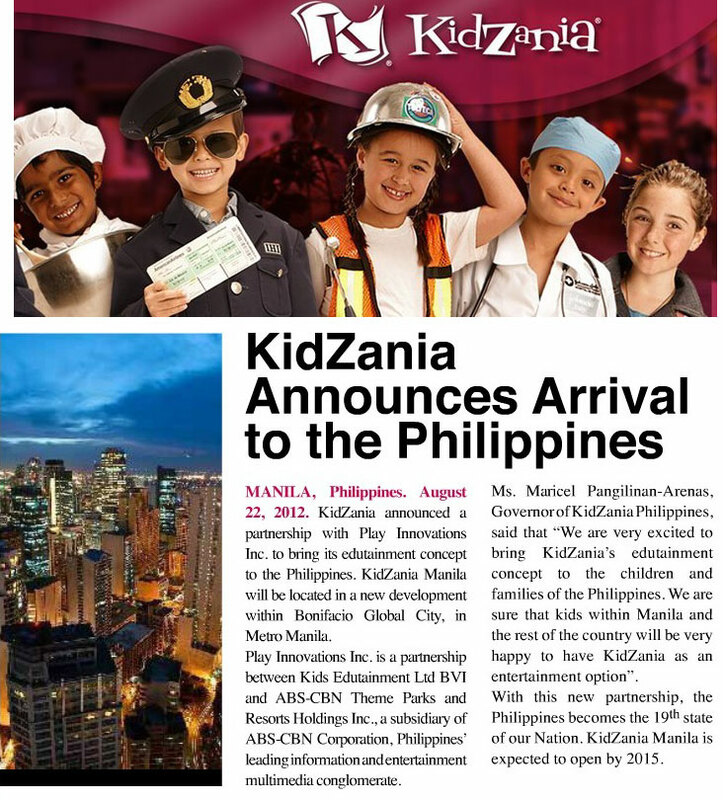 Kidzania Manila, a new indoor theme park for kids, will soon open in 2014 in Bonifacio Global City in Metro Manila. The educational theme park is designed as a real city to provide the ultimate role playing opportunity for kids 3-14 years old. Children and their parents are provided with a safe, unique, and very realistic educational environment that allows kids do what comes naturally to them. Activities include role-playing by mimicking traditionally adult activities. As in the real world, children perform "jobs" and are either paid for their work (as a fireman, doctor, police officer, journalist, shopkeeper, etc.) or pay to shop or to be entertained. The theme park is a city built to scale for children, complete with buildings, paved streets, vehicles, a functioning economy, and recognizable destinations in the form of "establishments" sponsored and branded by leading multi-national and local brands. Founded in 1997, Kidzania has locations all over the world in Mexico, Dubai, Japan, Korea, Malaysia, Thailand, Kuwait, and many other countries. Future locations include U.S., England, Russia, Saudi Arabia, and more.